So, the holidays are over. I hope all of you enjoyed your holidays in whatever way you celebrate. Things were pretty quiet around the house, we mostly just relaxed. But there was crafting going on here as well. I was able to complete several projects, as the weather was pretty mild and allowed me to work in the garage most days. And this allowed me to complete a project that I have been looking forward to… a project piece for me! Some time ago, a church here in the KC area was doing clean up work on one of their warehouses. 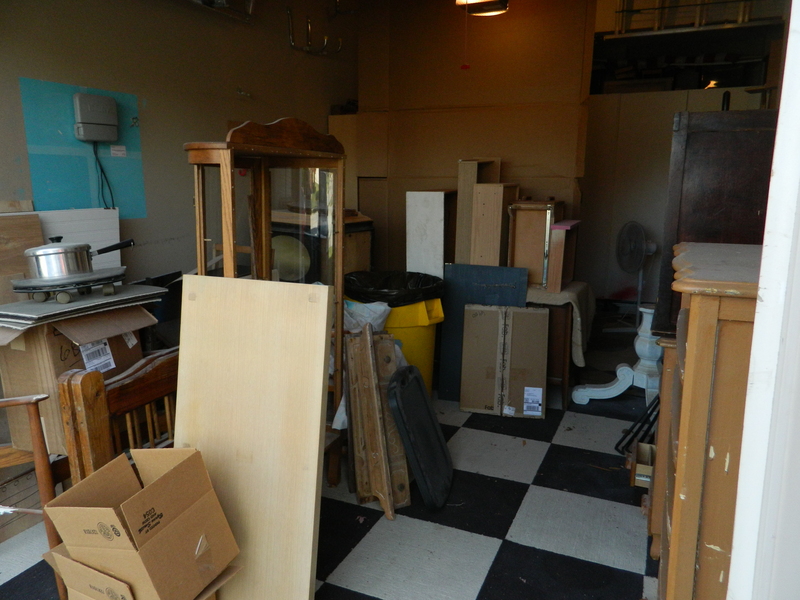 They were giving away a bunch of wood items: pews, chairs, tables, trim, desks, doors… you name it. I came and went at least three times over a period of a week. One of the pieces I picked up I knew I wanted to keep, but often the projects done for me take a back seat to the projects that I sell or do for others. But now as I am working diligently to clear out the garage and my foyer, I made time to work on this piece. A pew. This is solid wood and heavy and simple in its finish. I opted to make my bench five feet long – it could have been longer or shorter, depending on the seat, there were so many to choose from. I could have used a weight support to make it longer, but I really wanted just the five feet. So, this photo shows the two ends, the supporting center and the actual seat and back of my pew. We must have had these in the garage for at least six months now… it always seems that projects I do for myself keep getting pushed back on the ‘to do’ list. 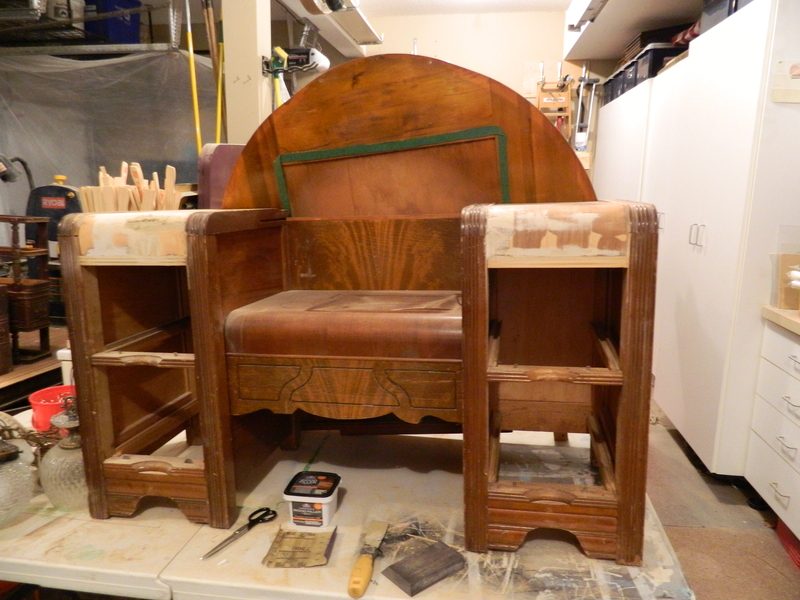 Initially, I wanted to refinish the pew. After about eight hours of sanding, it was pretty clear that the wood beneath it wasn’t going to be best for staining. I debated back and forth about what color to paint it… the off-white color of my house’s interior trim, my very favorite Deep Space black or of course, “Kitchenaid Red”. Red finally won. Now all these months later, we started on putting it together. Of course, being the optimist I am, figured we’d just slap it together with glue and screws and be done in a matter of a couple of hours. This was not to be. When we picked out the pieces of furniture we wanted to buy from the church, it was me and The Kid. I walked around this huge warehouse just pointing and deciding on everything I wanted. I noticed that the pews ends and seat/backs were numbered, like a giant jigsaw puzzle just waiting to be put back together. Little did I know when I sent The Kid back down for the second load, he didn’t pay attention to the numbers and just grabbed the nicest looking ends and seat/backs. Well, they didn’t go together like we hoped. The ends came with a bit of the former seat still in the grooves. You can see it in this photo to the left. I knocked those out easily enough – they were there to keep the grooves from swelling. But when it came to replace them with the seat/back that I had, they weren’t the same angle or length. 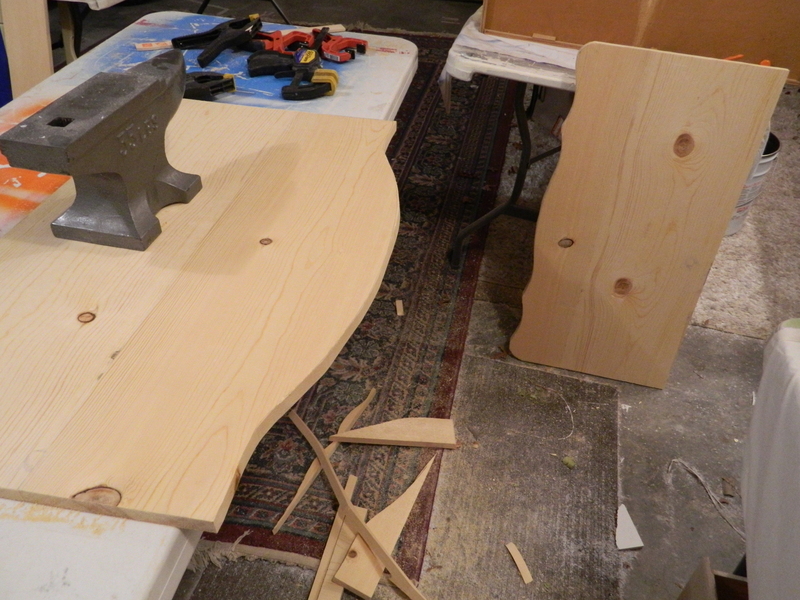 I had to widen and extend the grooves to the shape and angle of the seat/back that I had. Out came the router and other than bumping into a nail, it was a breeze to enlarge the space. The left side was first and not really knowing what I was doing, I did make the space a little too large at some points, but when it came to the right side, it was perfect. So well fitting that I could slip the seat/back into the groove and it held on its own! I could have cut the seat/back into two and used the center support, but that would have meant having two seats of about two and a half feet rather than one long five foot seat. Its a beautiful piece of wood, though, I will do my best to use it in another project. Now, it was time to permanently attach the ends to the seat/back. Using wood glue and screws, The Kid put together one end and then using the weight of itself to hold in place. The we flipped it over and attached the other end. Oh, did I mention that hours and hours and hours of sanding? Thank heavens for electric sanders, for I know I wouldn’t be that enthusiastic about wood working! 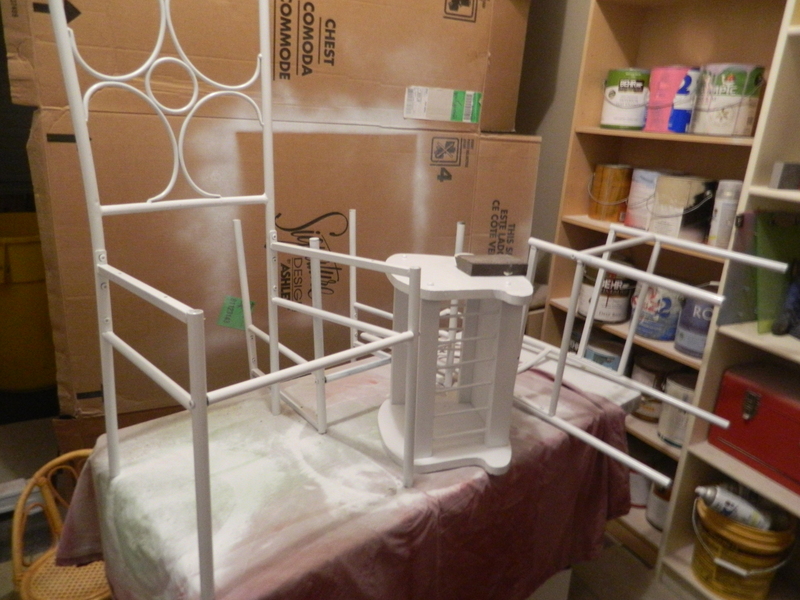 Ready for priming. I settled on my old favorite (remember I’m keeping this piece!) red although I didn’t have any gray- or pink-tinted primer. I was quickly reminded why a tinted primer works best under red. Without the tinted primer, it took more than four coats of red to cover the pew. Even after moving it into the house, in different lighting, more areas were identified and I actually ended up painting almost another full coat! And here it is in all of its red beauty! I moved everything else out of the foyer to make room for this piece. I am thinking about putting a row of low growing plants underneath it, if for no other reason than to keep it from filling up with shoes and bags and junk that gets shed when people come into the house (right next to the door to the garage as well as the front door). I am determined to keep this area clear. A couple more photos from different angles. Isn’t that shiny finish beautiful? I just love it. I have more projects to unveil, it has been a busy week while everyone’s been celebrating. I’ve been having fun as well. Big Push to Clear the Garage, About 5 Projects at Once! Temperatures in the midwest (all over the country actually) have dropped sharply with the advent of this ‘arctic air blast’. All I know is one day I am driving home from work with the windows down, temps about 70 degrees with a slight breeze, and overnight, there is a light snowfall, winds are brisk and daytime temps don’t break the 30 degree mark. Brrrr!! What the bigger picture means for me is that I need to get the third stall of the garage cleared, get the car washed/waxed/detailed and then safely tucked into the garage for the winter. Me thinks it is going to be a cold one! I picked up this cute little trunk at an estate sale. It had a name and some flowers painted on the top, so am really just in the mode to sand the top, prime and then repaint the entire thing. 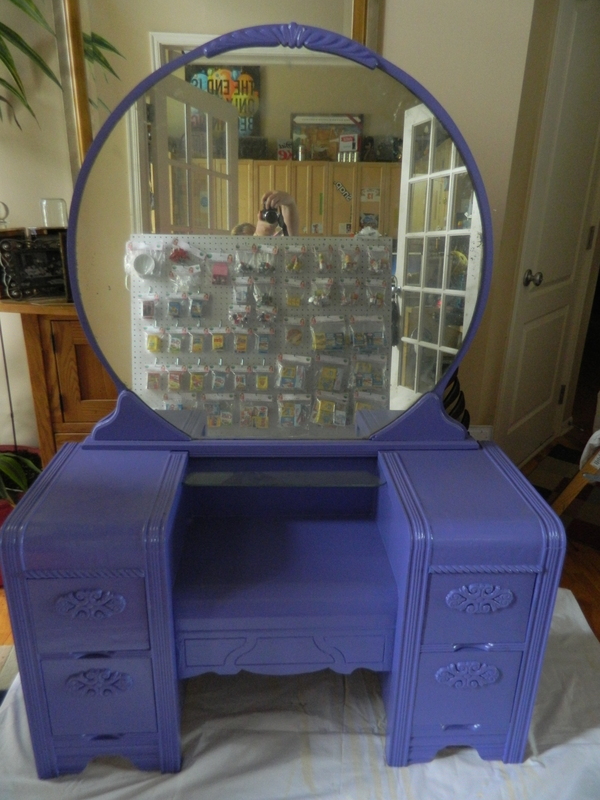 I would LOVE to keep this, as it matched all of the cabinetry in my sewing/craft room, but I don’t think it is possible to square that much space out from the room! Dresser Number 1: This five drawer dresser is a solid piece of furniture and has a matching 3 drawer chest as well. These are slated for the pink ombré style and hopefully will be sold together. I use all of the darker shades of pink from the left card and the bottom (Scented Valentine) from the bottom of the card to the right. 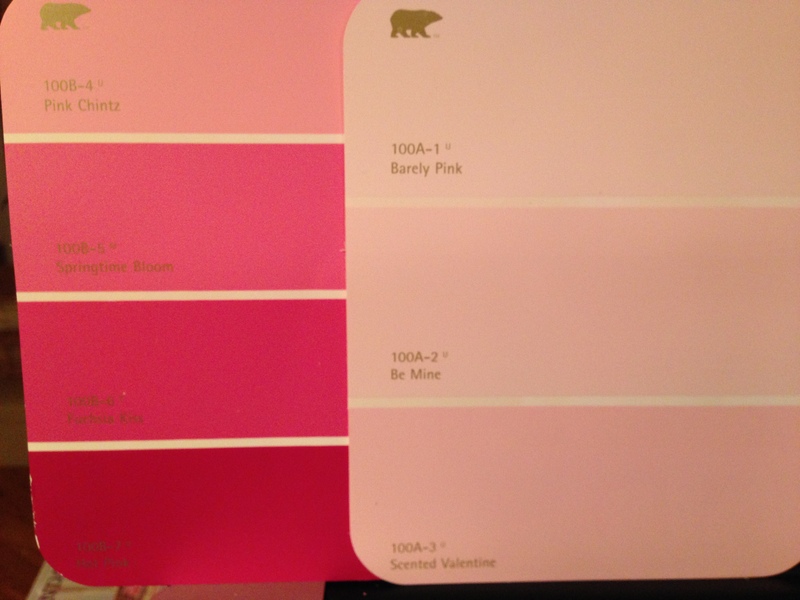 The cabinet color is the top and lightest pink (Barely Pink) which paints oh so beautifully over the white primer. 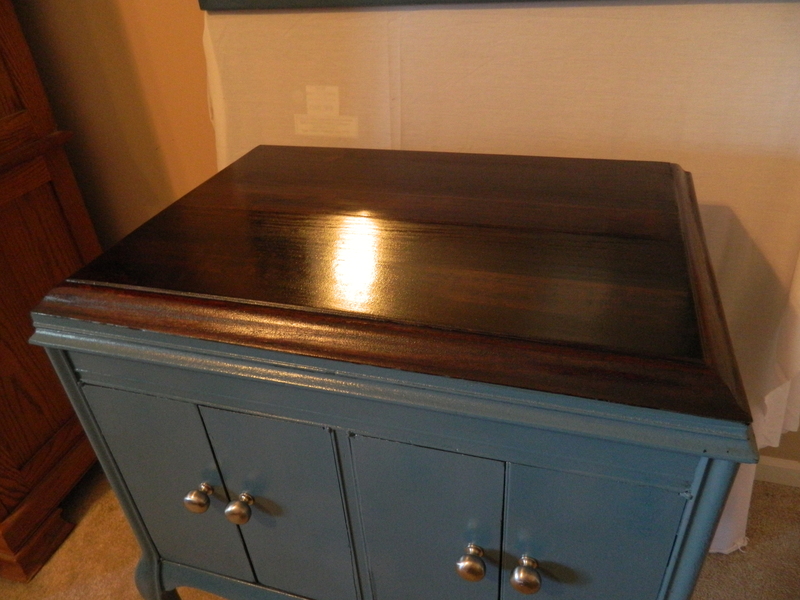 I haven’t quite decided on this dresser… the drawers have ‘cut away’ handles, which I am not fond of. On occasion, I have been known to fill these in with wood filler, but the depth of these are probably too much to fill. 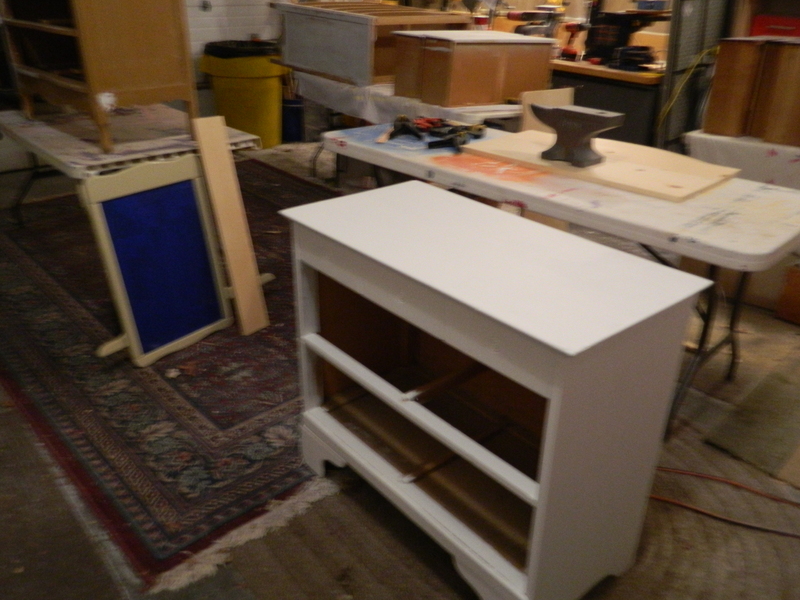 I am giving some consideration to doing another suitcase dresser (you can see them here and here), although that process takes considerably more time than just paint. We’ll see how the rest of the projects are going before I decide. 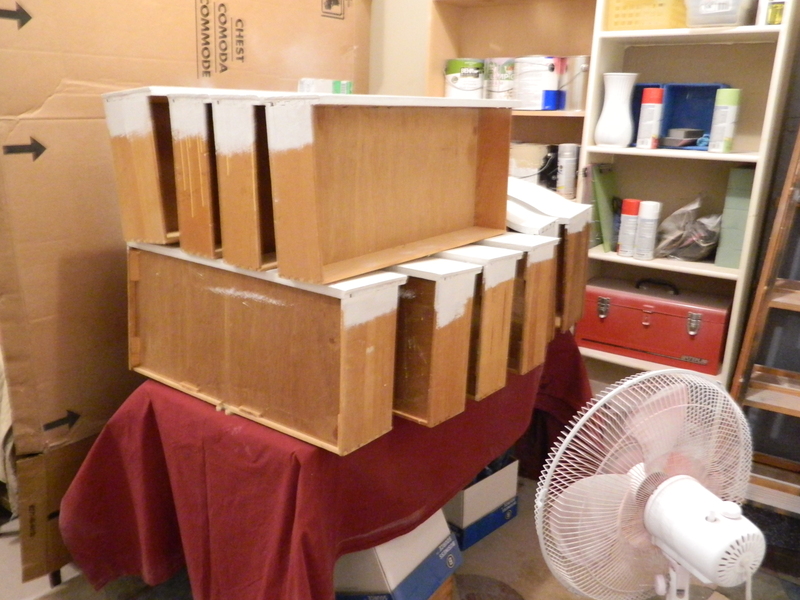 We needed some room to work tonight, so all of the primed drawers have been piled up on a table in my “paint booth”… no spray painted needed for the next few days, so I am taking advantage of the unused space. 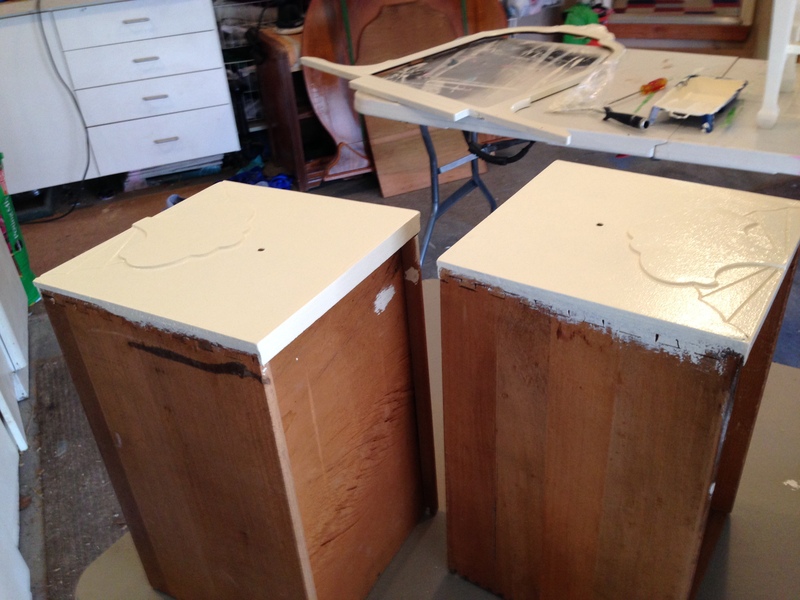 Two of the dresser cabinets required new tops. It never ceases to amaze me how much damage a person can inflict on the top of a dresser. 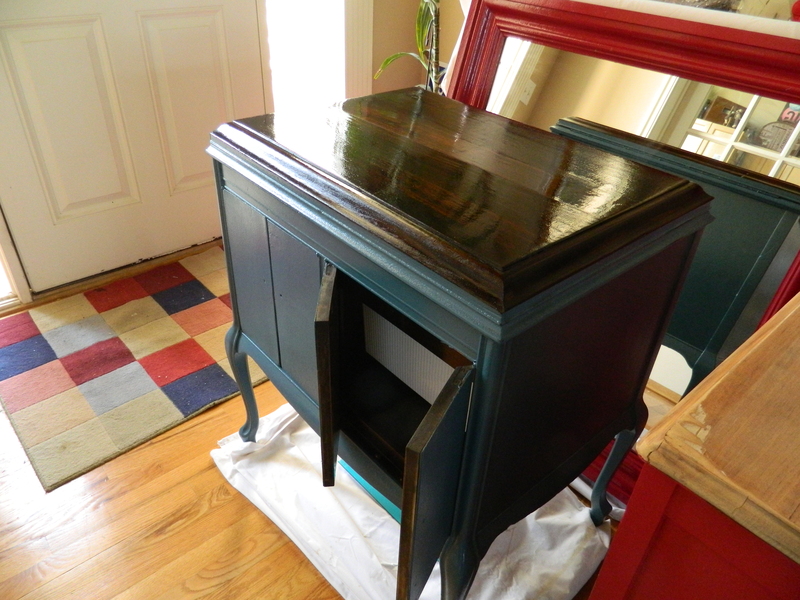 But, honestly, it is so much easier to replace the dresser top than drawers and sometimes it is all that is needed to make on older piece look brand new. We procure two 1″x12″ of pine and look for boards that don’t have too much knotting or overt grain patterns (above). Once in a while, I even just stain the top if it looks nice enough. The boards are fitted together, glued and clamped. 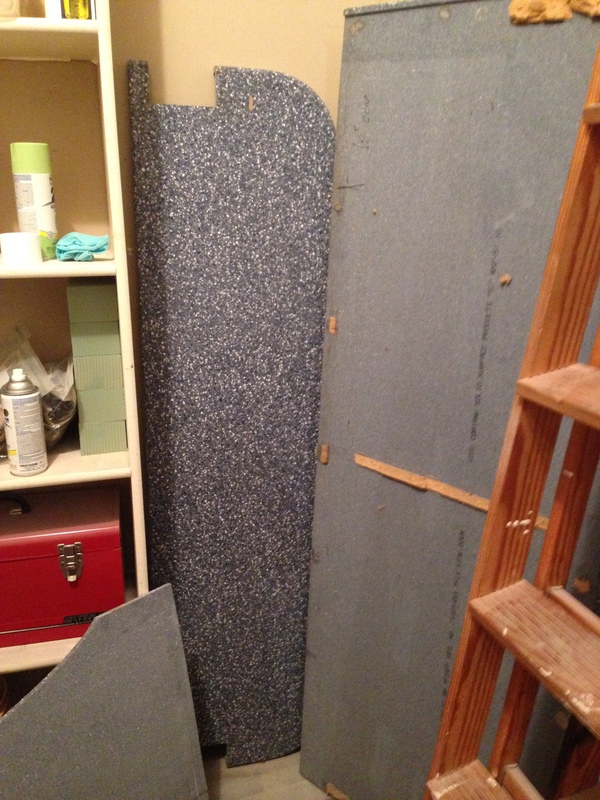 Once the glue had dried and clamps removed, the board is cut to length (essentially cut in half). 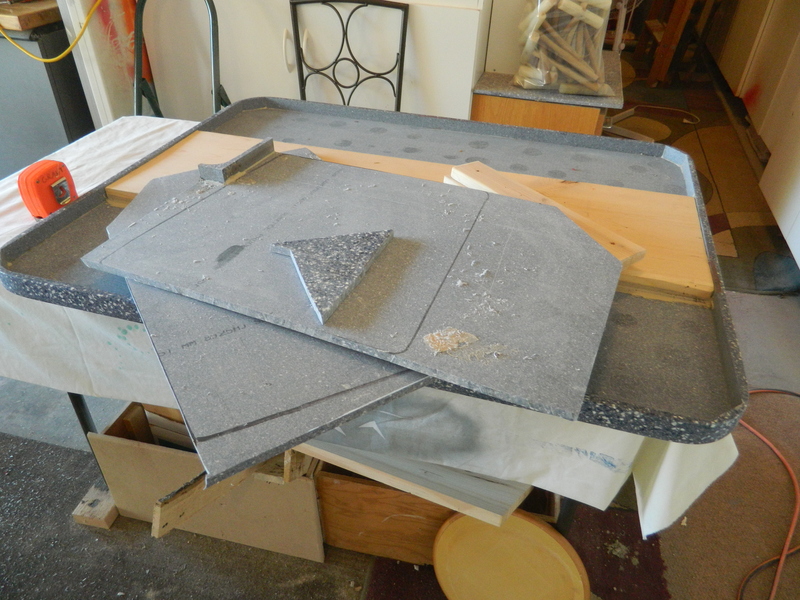 Then using the tops that were removed from the cabinets, the exact shapes are traced and a jig saw is used to cut them out. You can see one on the floor and the other on the table. Next step is to route a nice edge and then some sanding. 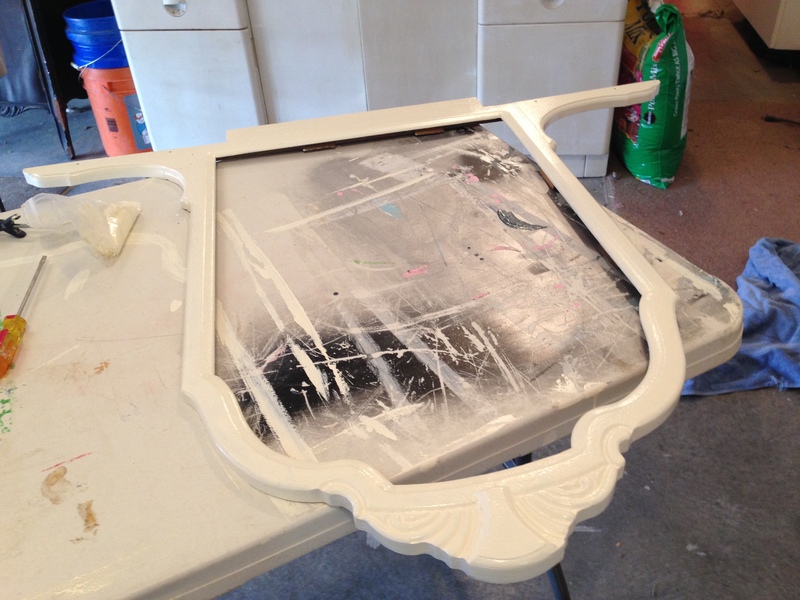 Here is the mirror and frame for one of the dressers… this is bound to be part of a pink dresser. A shot of the “other side” of the garage… where my sports car needs to hibernate for the winter. Doesn’t look like it, but we’ve really made a big dent. And once sold, it should be a nice little chunk of money. The Kid is hoping to use the money as a down payment for his real “first” car. It is giving him some real incentive to keep him working. We started this out on Sunday, things neatly lined up – being accessed, planned and prep’ed. If you’re wondering about the carpets, I collected them from CraigsList. They make standing in the garage much nicer, they help to soften noise and it allows me to run out there without shoes on, if I need. Plus, for some odd reason, The Kid is much more willing to vacuum the garage, rather than sweep. Go figure! Check out my work space! Isn’t it lovely? I so enjoy working here now that things are clean, organized and equipped. Much work still to be done, but we’re making progress! Its been a lazy kind of weekend, it seems each time that I muster up enough energy to get started, I fizzle quickly. It was all I could do to work up enough energy to sort through the third stall of the garage. Trying to identify everything that could possibly be either discarded or thrown away. Then what was left was organized such that it is each piece is easily reached and I did a mental checklist of the projects left and their relative level of effort required to finish. 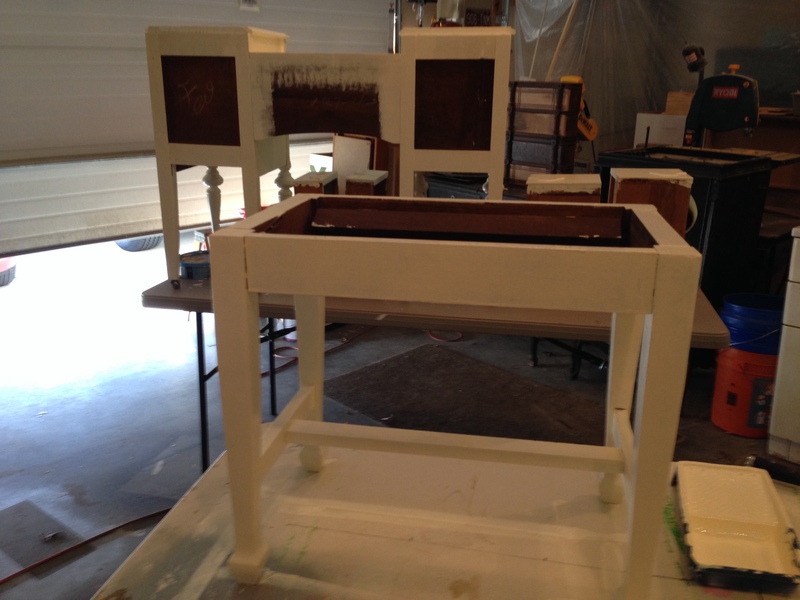 The project that is currently under way – has been under way for some time – is the kitchen table and chairs. I don’t know if you recall, but months ago, The Kid and I picked up some Corian countertops from the friendliest woman via Craigslist. She had gotten the counters from her dad (I think she said) and she had hoped to use them for an outdoor kitchen but her husband had put his foot down and wanted them gone from the backyard. Of course, I couldn’t resist, even though I didn’t have a particular project in mind. I love it when something happens that makes it worth the gas and time to pick it up. One of the pieces of Corian that was included, was a squarish piece that had edges, it appears to have been used for an island. And it just so happened that I had been on the receiving end of an antique sewing machine and table. I wanted to use the base for something, I love the character that comes with things that were manufactured or built in the previous century. And the square base sat perfectly onto the frame. To be complete, however, I had to have chairs to go along with it. And they had to be similar in style. After watching CraigsList for some time, even scouring the For Sale listings, I saw the ad in the FREE section. There were four of them, although two were broken and needed repair. But I thought that perhaps two chairs were enough given that it was a small table, perhaps to be used in a breakfast nook. 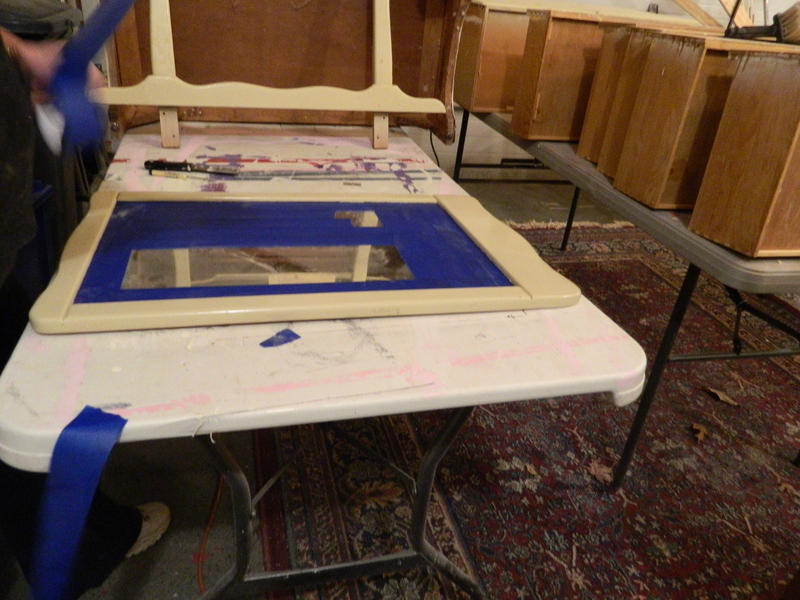 So far, I’ve been able to get the base of the table painted, as well as the chairs. To give the chairs a little more heft, I filled the tubular legs with sand. By using both broken chair, we were able to actually to get one good chair. So this table set with have three chairs. Next up, today, we cut the rough shape of the chair seats from another piece of Corian. 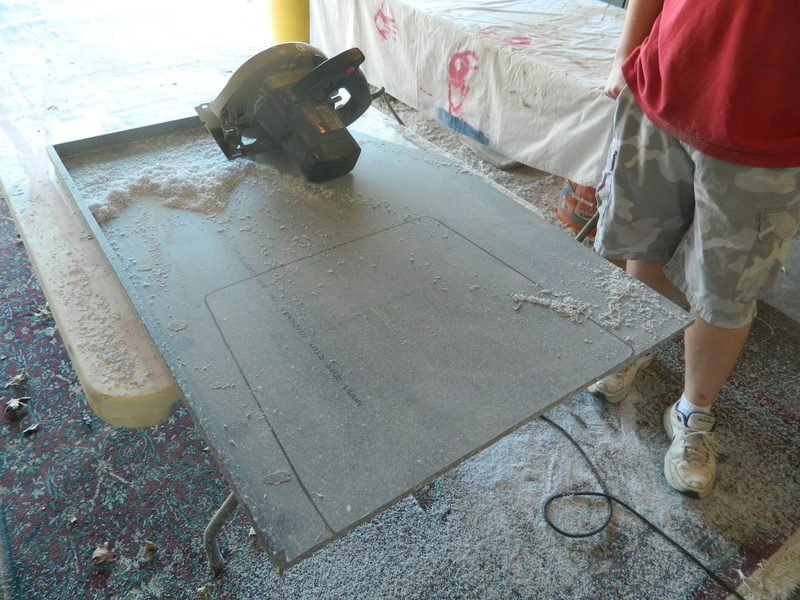 I had heard and read that Corian would cut just like wood, using the same tools and methods. I was nervous but The Kid helped out and used the circular saw to cut the patterns I drew. I took a piece of Corian scrap and worked it with the band saw and the belt sander and to my amazement, it did exactly what it should. It did take a little more time (and patience) but in the end the normal tools worked. 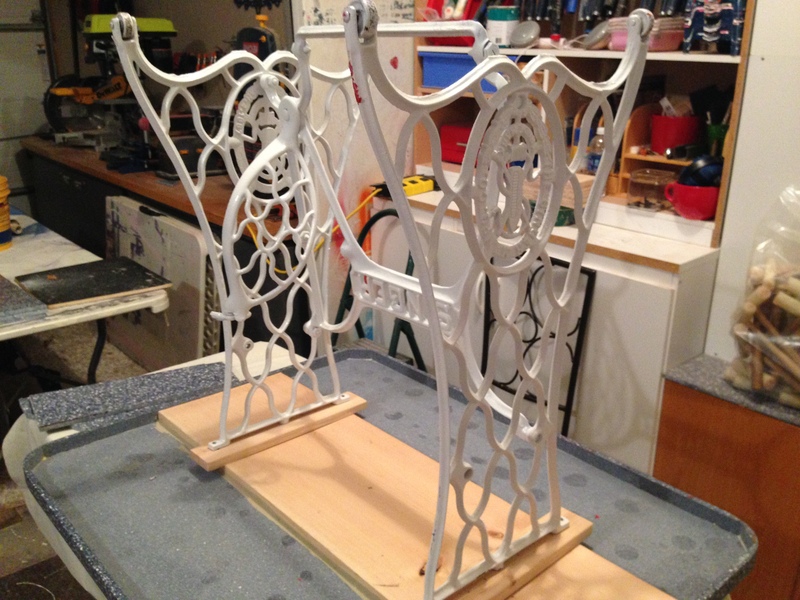 So, next up is to finish the chair seats and then attach them to the table. We also have most of the table assembled, we’re going to mount pieces of wood to the base and then bolt the base to the wood we’ve attached to the bottom of the table. This one is soon to be completed. Okay, I’ve been writing while watching some old scary movies via Netflix and we’ve just started “House on Haunted Hill”, the original with Vincent Price, so I need to publish and turn my attention to The Kid and the movie. Come back soon to see the completed work! Have I told you how much I love CraigsList? In my city, it is amazingly active, including the Free section. 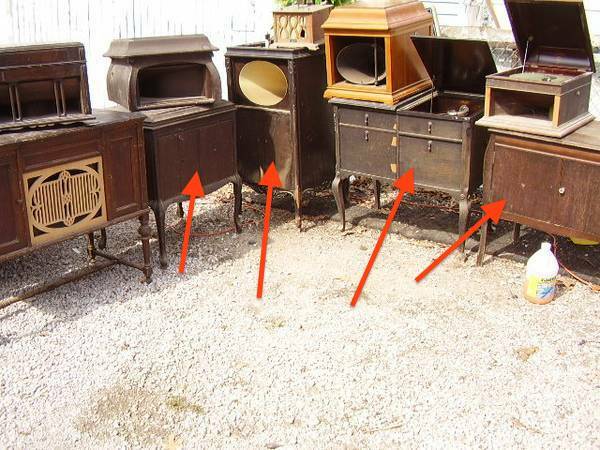 For instance, a few weeks ago, I picked up four Victrola cabinets from a man who restores them… but it often took many different units to get enough parts to get a single player in working condition. He had accumulated quite a few and apparently one night, it was more than he could store. So, I have finished the first two. One for me and one to sell. Let’s start with the one for sale. It would be the one to the furthermost right in the photo. 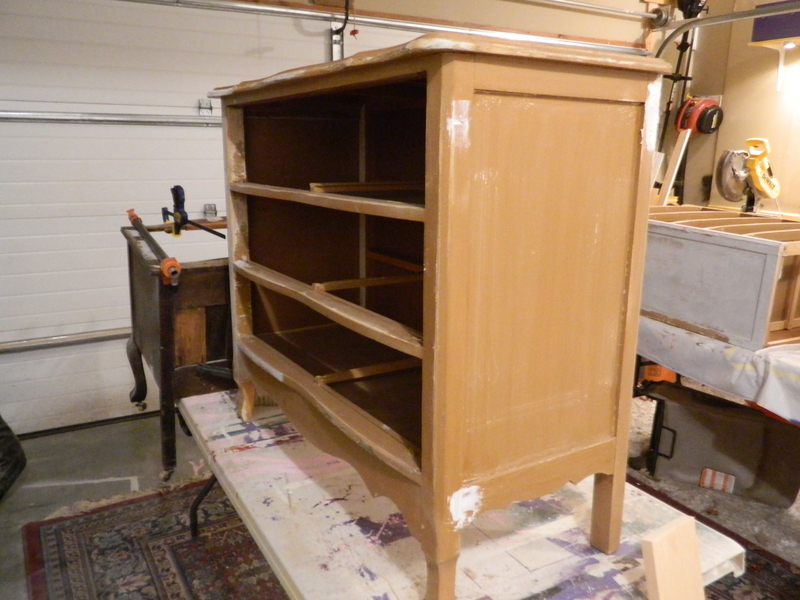 The top was in decent condition, so it was sanded down to the original wood. 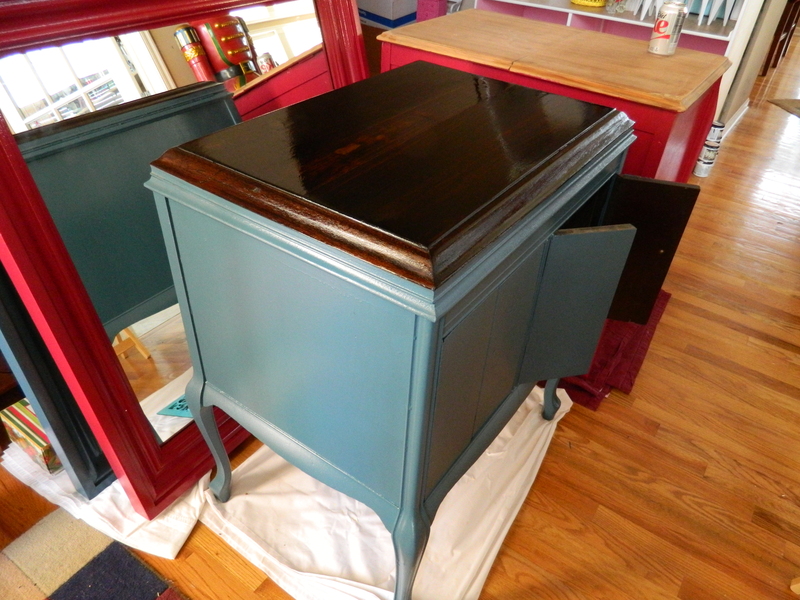 Following, it received several coats of a dark turquoise color. I was careful to paint only the body. As I said, I sanded the top down to a beautiful wood grain, so I gave it two coats of a walnut stain followed by two coats of polyurethane. The top just shines. I fitted the right side (where the megaphone and the actual phonograph had been) with a plastic tub for ice. 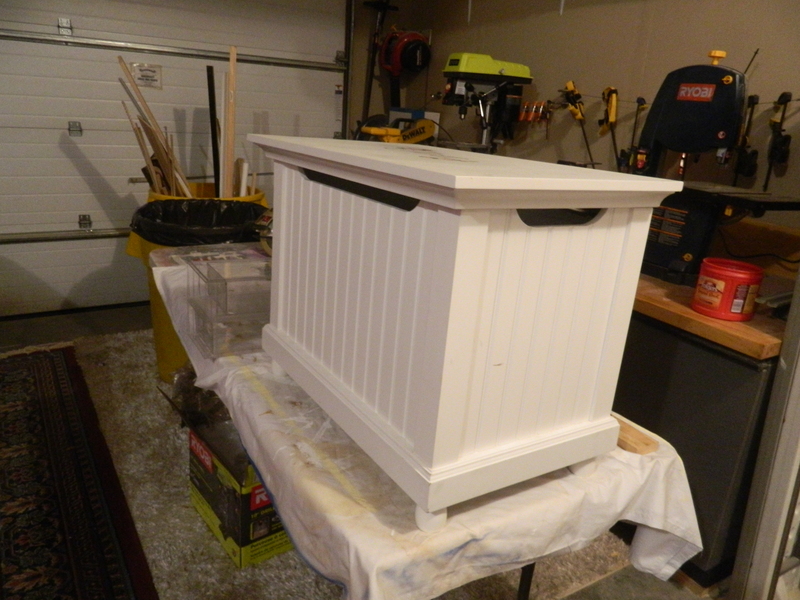 I found one that fit almost perfectly, adding a ledger for the lip of the tub to rest. All of the interior wood was cleaned and a coat of walnut to enhance the existing wood finish. This thing was in absolutely beautiful condition. 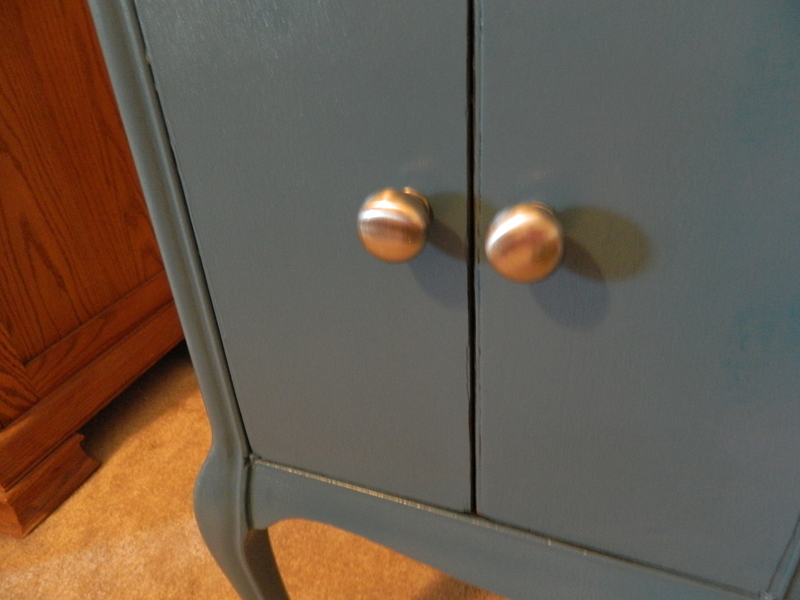 I added the brushed nickel knobs to complete the cabinet. I had wanted to purchase some old decanters and at least one set of high ball glasses and maybe some champagne class to set a nicer stage for photos, but the whole idea of this thing is to make money – as much as possible. I picked up three mirrors a couple of years back from Penney’s outlet store, they were $200 originally and marked down to their final price of $20! When I saw them, I couldn’t say no, even though their wood finishes were very scratched. My instinct was to paint them anyway, so I had purchased all three. 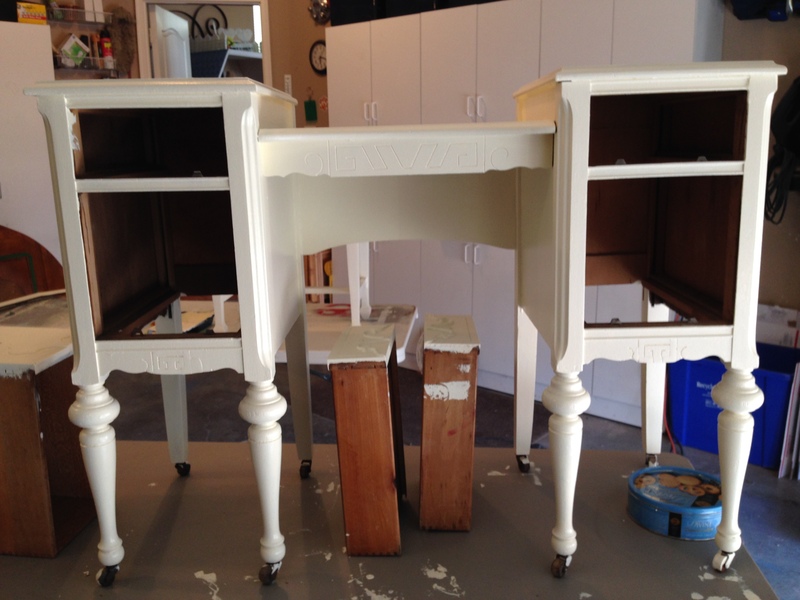 I painted one with the same paint as the cabinet and am selling them as a pair. A few more photos of the cabinet for your viewing pleasure. I have another almost finished that I have decided to keep. I will show you that one soon. 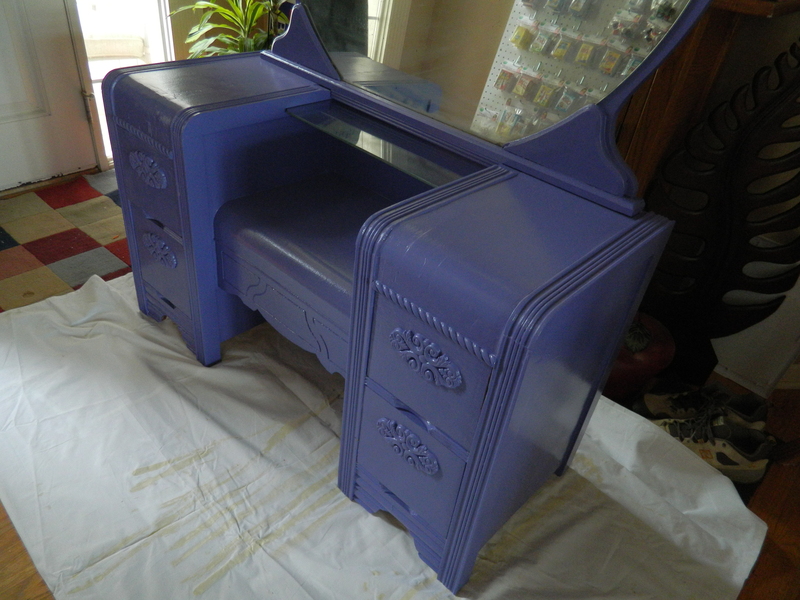 The next project I finished though, is this nice vanity… well, the finished product is nice anyway. It was in pretty bad shape with I picked it up though. This one took quite a bit of work to get it to the point of being able to paint it. I had determined to do something different this time, rather than the standard pink or (off) white. Lots of young girls like pink, but there are probably about just as many who like purple. So I started with a purple I had in stock. 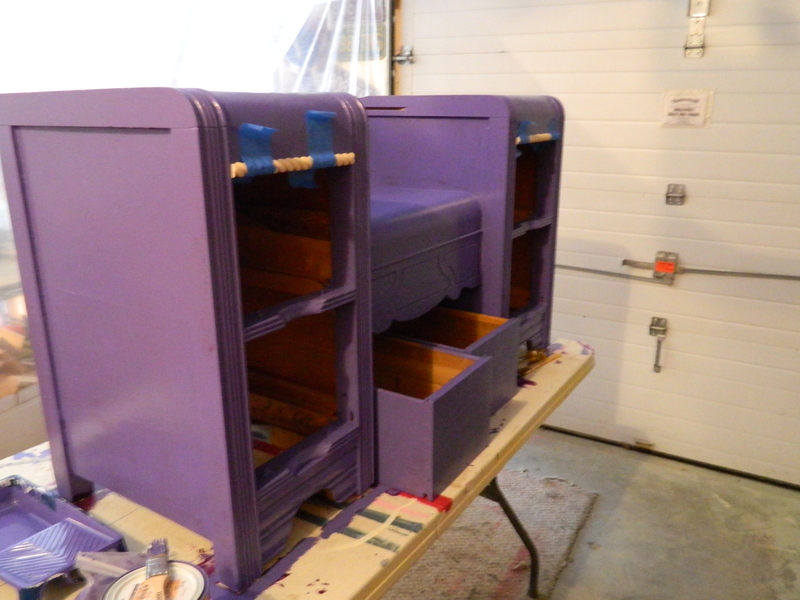 After the first coat of this particular purple, I thought that it looked a little too much on the red side of purple, so I purchased a purple that leaned toward blue spectrum and started the painting process all over again. 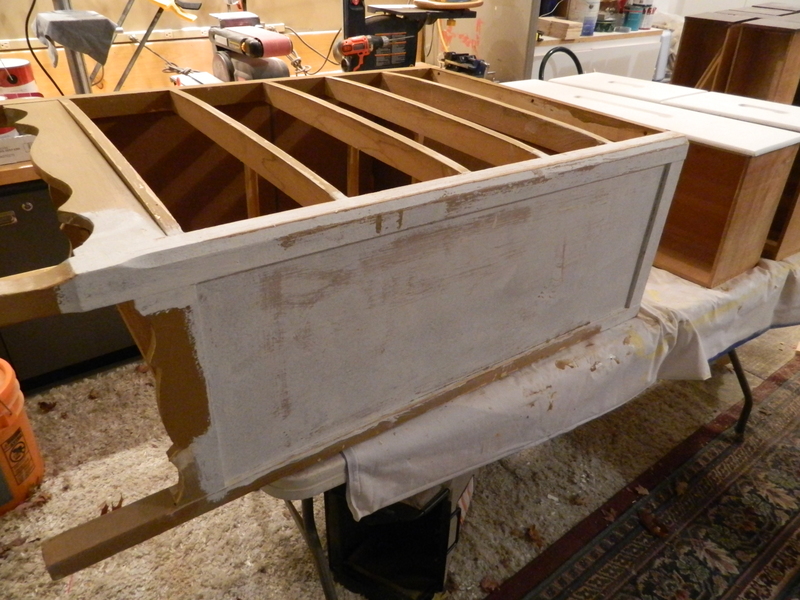 I also added the wood detail on all four of the drawers as well as the rope trim, since sanding required most of the original trim to be removed. I also purchased a piece of quarter inch glass for the shelf in between the cabinets. I think this came out really beautiful. One of these days I am going to have to figure out how to take good photos of furniture with mirrors. I always seem to get a reflection of the weirdest stuff when I take them! Here it is in all of its purple glory! 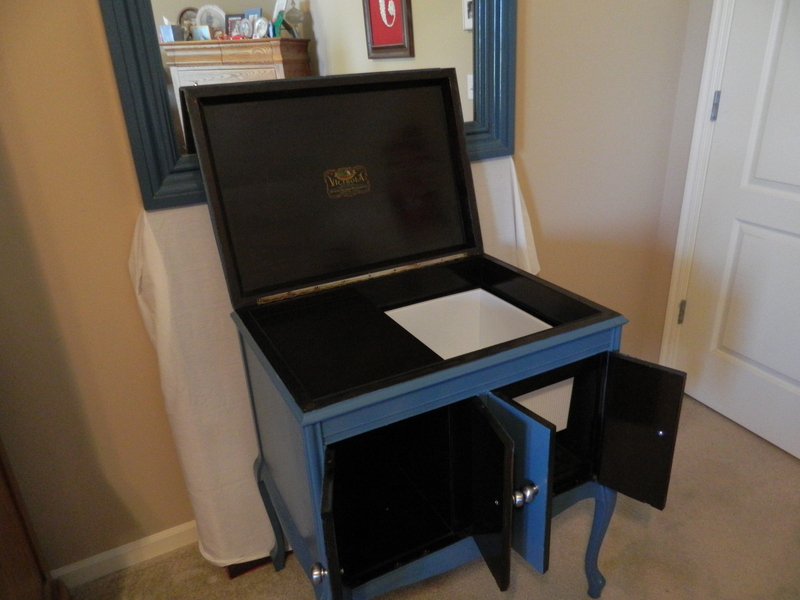 I have these two pieces listed on CraigsList and hopefully they will sell quickly. I am working on one more, almost done and then there are two more that I have to get started on. Had a break in the weather – actually had a couple of days with temperatures in the seventies. And then, of course, it dipped back down today to make it too cold to paint in the garage again. So frustrating. 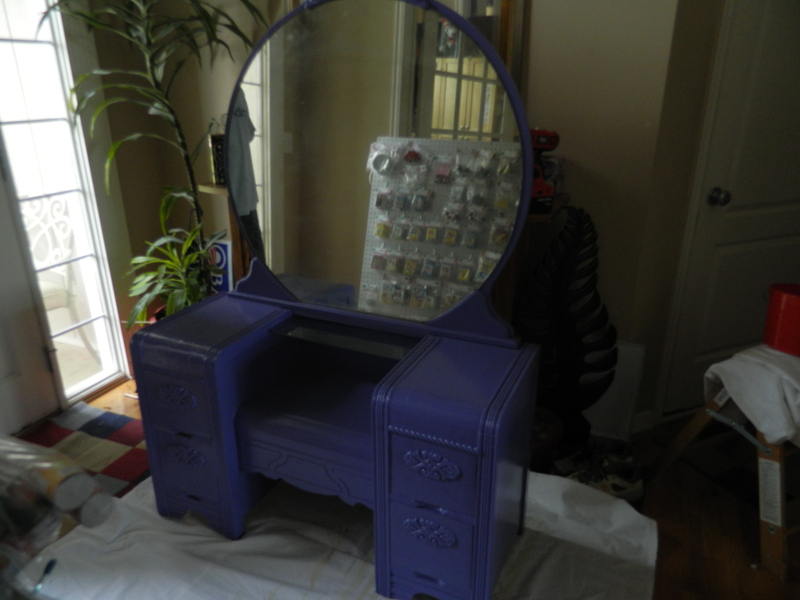 If temps don’t go back up soon, I will be bringing in the latest aquisition of a vanity to work. I thought I’d give you a sneak peak at the pieces as they are drying their third coat of paint, using my new favorite color and sheen. I am using high gloss paint in a shade called Vanilla Custard. It is a warmer than an ordinary white, bordering on a very light yellow. I had originally planned to use it in conjunction with some touches of Blush Pink, but now am giving that color scheme a second thought, I like the Vanilla Custard all by itself. The bottom large drawers have a beautiful motif on their fronts. This may (or may not) be highlighted in a coordinating pink. The primary body of the vanity in the Vanilla Custard. Three coats of paint in high gloss finish make this piece just shine. Love the front legs on this piece. Even though you can’t see it in this photo, the smaller drawers have some extraordinary motifs as well. The mirror frame also has some nice carved detailing. This piece required the most work, as all of the joints had come loose or apart. Just need to reinstall the glass and re-attach to the vanity. Small piano bench I picked up that had a warped bench top. Removed it and will be replacing with a padded cushion in the softest fabric in the same shade of white. Like the leg detailing… not too much and not too little. Both pieces were found objects, absolutely free! The big investment besides elbow grease and some screws and glue was the paint at a hefty $17. I am tempted to keep this one, but it really is completely different than my current bedroom style. Well, that’s it for tonight. Come back soon for the unveiling!